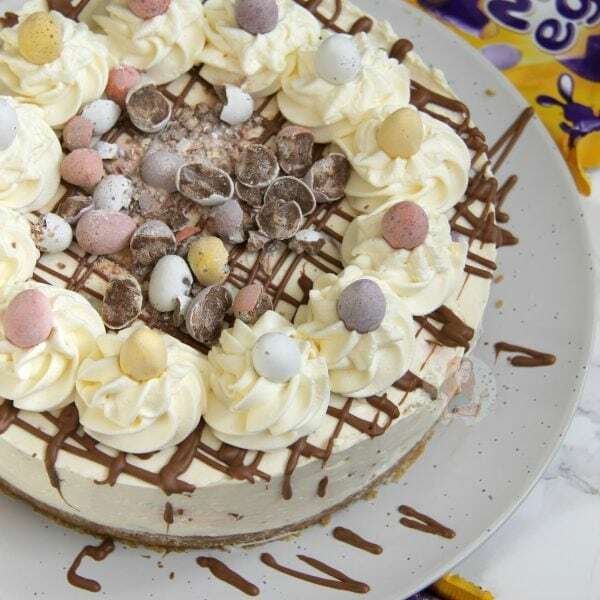 A Delicious & Sweet No-Bake Vanilla Mini Egg Cheesecake with a Buttery Biscuit Base, full to the brim with Mini Eggs – Perfect *non*bake for Easter! 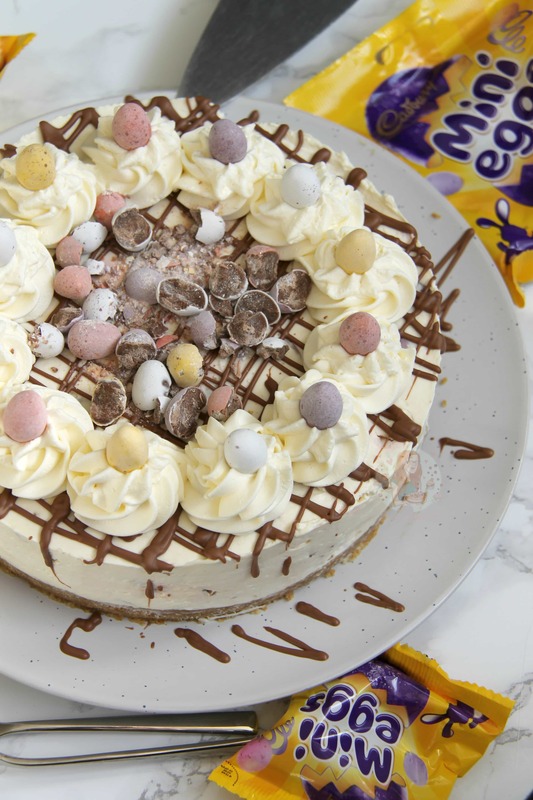 SO like, yeah.. its Easter, which means a DELICIOUS excuse to make something I have wanted to create for aaaages.. a No-Bake Cadburys MINI EGG Cheesecake!!! I just can’t cope with how in love with this I am. 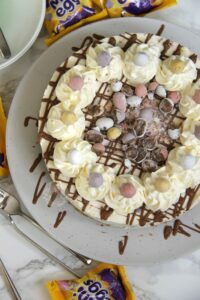 What could be better than an easter themed cheesecake recipe!!! 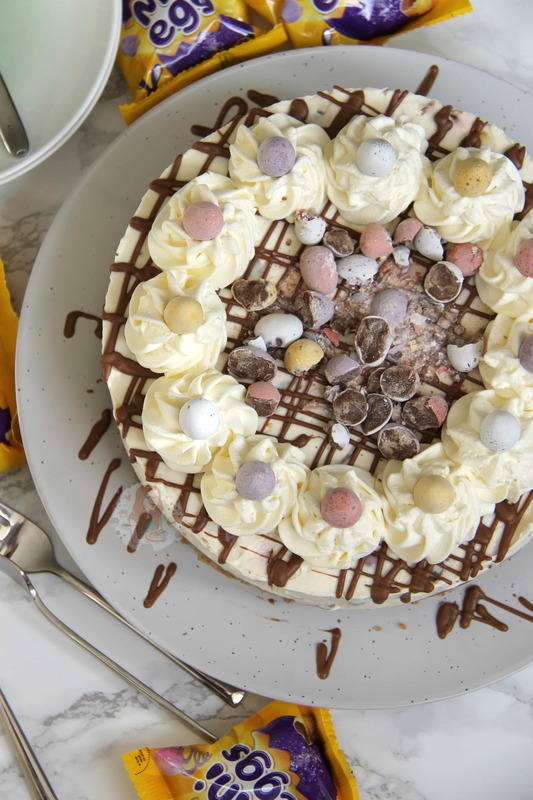 After the success of my Easter Nest Cupcakes last year, and the down right overwhelming success of my Mini Egg Drip Cake the other day, I know you will LOVE this recipe. 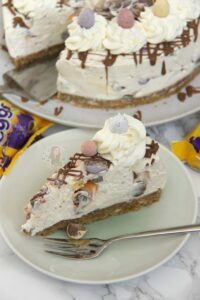 The digestives in the base gives a perfect biscuit crunch, and marries so well with the flavour of the cheesecake.. along with chunks of Mini Egg in every mouthful. 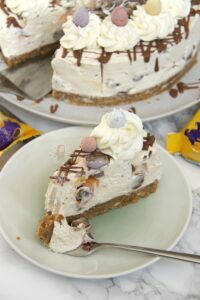 A Vanilla Creamy Cheesecake filling, topped with sweetened cream, Chocolate, and even more mini eggs is heaven. I did also decide to make this cheesecake a little deeper, as I prefer my cheesecake to look delicious in a slice, and not thin or flat. The little swirls of cream on the top, along with some mini eggs gives it the delicious ‘janes patisserie’ flare that I am obsessed with. I did of course drizzle over some chocolate, as I just. can’t. resist. Its meant to be a show stopper, and it definitely is! Whenever I make a cheesecake that doesn’t use something melted like chocolate to help it set, I tend to use Mascarpone as I find it sets SO much better as its firmer anyway, but Full-Fat Philadelphia is really good to use too – I just don’t like supermarket own brands. So anyway, enjoy this recipe.. and let me know how you get on! I really desperately recommend using a 8″/20cm Deep Springform Tin in this recipe, and a 2D Closed Star Piping Tip for decoration! (Affiliate links). They’re my go-to bits and bobs for a cheesecake! However, some people do struggle with getting the cheesecake off the base. I simply run a knife underneath the biscuit base, and it comes off. You can line the bottom of the cheesecake with parchment paper if you wish, but its a bit faffy to get off afterwards. The 2D Closed Star Piping Tip also gives the prettiest and easiest of swirls and its my go to tip for all decorating! 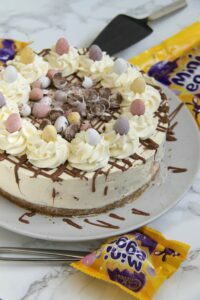 A Delicious & Sweet No-Bake Vanilla Mini Egg Cheesecake with a Buttery Biscuit Base, full to the brim with Mini Eggs - Perfect *non*bake for Easter! Blitz the biscuits in a food processor to a fine crumb, or mash them up in a bag/bowl and add the melted butter - pulse a few times until it is combined well. Tip into an 8"/20cm Deep Springform Tin and press down firmly. Chill in the refrigerator whilst you do the rest! With an electric mixer (I used my KitchenAid or an electric Hand Whisk) Mix the Cream Cheese, Vanilla and Icing Sugar together until smooth. Once whisked, pour in the liquid double cream and continue to Whip the Cream Cheese/Cream Mixture until it is starting to thicken. Don't whip it too fast, I whisk it on level 6/10 on my kitchenaid maximum. Too fast and it may split.. better to be slightly under whipped than over whipped! Once its thick, fold through the chopped up mini eggs. Spread onto the biscuit base and spread evenly. Leave to set in the fridge, covered, for 5-6 hours, or preferably over night. Carefully remove the cheesecake from the tin, and drizzle over some melted chocolate. Decorate with some whipped cream... Whip together the double cream & icing sugar and pipe on in swirls! Add a Mini Egg per slice, and sprinkle over some crushed mini eggs. Recipe Updated March 2017 - Original recipe used 750g of Cream Cheese rather than 500g, use the same method but with the extra Cream Cheese! Either is completely fine. As this recipe doesn't use a chocolate to help it set, I prefer to use Mascarpone compared to Philadelphia as it created a firmer set - however, either will work as long as they're full fat! I always set my cheesecakes in the fridge overnight otherwise they risk being a little sloppy still and you're more likely to get a better result for the longer you leave it! And yes, the colour may run slightly from the mini eggs, but this is just normal as its being refrigerated! Older Next post: Chewy Chocolate Chip Cookies! Newer Previous post: Easter Rocky Road! Pingback: Easter Mini Eggs Cheesecake: You Don’t Want To Miss Out On This One! Ah yay! And yes, each to their own, I find whisking the liquid cream into the mix much easier and much much firmer! Could i say half all the ingredients to make a smaller version of this? Just made your cheesecake Jane it was amazing my daughter wanted it for her birthday. Tried a few of your recipe there awesome. Double Cream is the fattiest liquid cream in the UK. It’s worth googling your alternative to it! Any tips for getting the cheesecake of the base of the tin. If I line with baking parchment do you think it will slide onto a plate? I havent made a cheesecake in years – first ones never went well lol. But I saw this and thought I’ve GOT to try this I go nuts at easter for mini eggs!!! In the recipe it states to use digestives but from some of the comments, people have used chocolate digestives? Does it matter whether plain or chocolate digestives is used? Thanks. p.s. I made your Maltesers cheesecake 2 weeks ago and it went down a treat with friends and colleagues! Can I add melted chocolate to the mixture to help it set? If I do, what should I leave out? Likewise, if I use plain digestives can I pour melted chocolate in to help set the base? I wouldn’t advise using melted chocolate on the base, it really doesn’t need it. And you can just add in 250g melted milk chocolate if you like to the mix, you don’t need to take anything out. Follow my other chocolate style cheesecakes for advice, such as my Toblerone one. Thank you. Its in the fridge for an overnight chill, it looks great. Ive made a cornflake cake nest with mini eggs in for the top. Hi can you freeze this cheesecake? Not sure there will be enough left but just in case!! Absolutely love your insta and your blog! Planning to make this amazing cheesecake for Sunday. Was wondering if you were to use 750g mascarpone do you need to increase the other ingredients please? Thank you! Doesn’t the whipped cream go runny? Whipped cream is different to squirty cream if that’s what you’re thinking of? Once you whip up double cream it holds its shape as it has a 47% fat content. Squirty Cream comes in a can and won’t hold its shape at all. I wouldn’t know if the Cool Whip would work or not I’m afraid! Hi.. would it be the same amount of mascarpone cheese as it would cream cheese? And what if I mixes them? What amount of each. Hiya – I don’t I’m afraid as I find cup measurements unreliable and I hate them aha! If you can, I suggest investing in a set of digital scales as it makes baking a lot easier! Or try converting into ounces ? I use any milk chocolate.. but I use disposable piping bags and snip the end off, so it’s a clean drizzle ? I buy my chocolate in 2.5kg bags, but any supermarket bought chocolate would do the same! Key is the disposable bags! Hi, I plan on making this tomorrow. Never made a non-bake cheesecake. Just wondering if it turns out liquidy or anything. What should I do? Can I put it in the bake worst case scenario?? Lol the ice cream comment got me worried! Made it! Looks great! Can’t wait to try it this evening for Easter! Happy Easter! Ahh great! Happy Easter to you too! Aww I’m so glad my Rolo one was a hit – and I really hope you enjoy this one too! Thank you!! I can’t get my hands on double cream in Holland. What can I use instead? Just plain whipped cream? Okay yes that should work as long as it’s the fattiest liquid cream you can find ☺️? Definitely going to try this for Easter Sunday! Thinking I’ll do a mix of Philadelphia and mascarpone.i made the rolo cheese cake at christmas and it was so easy to make and delicious! Ahh yes please do! I hope you love it! I can’t get over how beautiful this is! My cholesterol and I thank you for this! 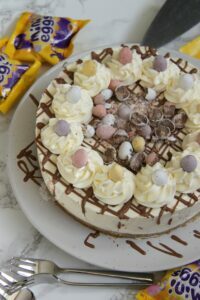 Looks so good and love the mini eggs topping! Looks delicious. I always like to use chocolate covered biscuits as a base too, choc hobnobs are good. You can never have too much chocolate!